Description: Two handles and spouted. Birds and flowers in underglaze blue on white grounds. Central gooseneck ceramic spout. Bristol Delft. 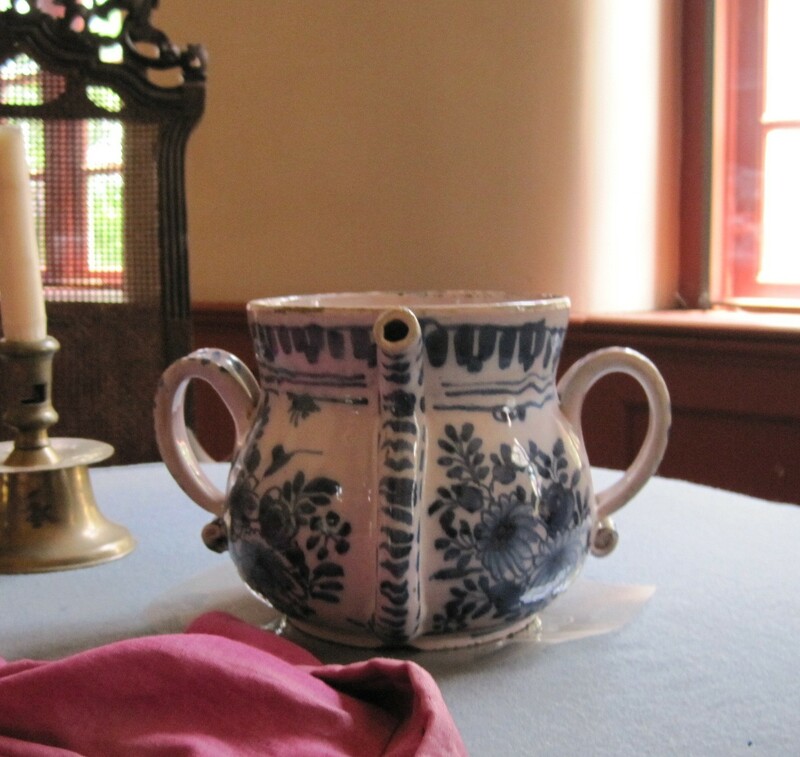 There are two posset pots in the Manor House, located in Hannah’s Closet and the Great Hall. A posset is a type of alcoholic beverage or dessert, similar to modern eggnog, made with cream, eggs, sugar, wine, and cinnamon or nutmeg. Served hot, this sweet treat had three layers: a foamy top layer followed by spicy custard, usually eaten with a spoon, with a strong alcoholic liquid at the bottom, which would be sucked out through a straw. Possets served ceremonial, medicinal, and social purposes. Traditionally they have been drunk for the celebratory toast made at weddings. Medicinally, possets were used as a cure-all treatment for minor ailments such as the common cold. They could also be present in social settings, as a nourishing and easily digestible beverage consumed in a relaxing or retiring setting. Possets were served in their own specialized container, a two-handled spouted ceramic mug called a posset pot. Posset pots were usually made of delftware with little variation in their blue and white painted glaze decoration. 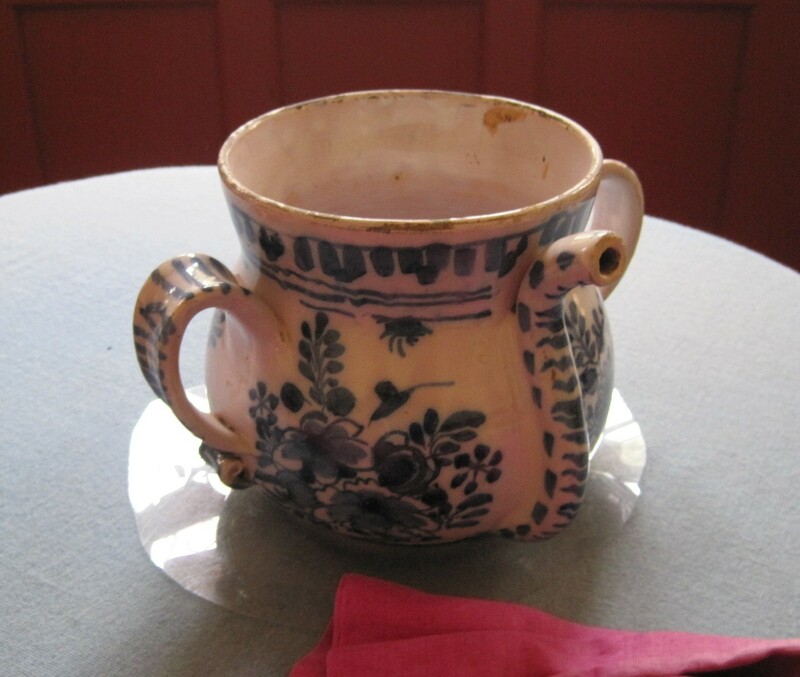 This particular posset pot originated circa 1700, during the peak of delft popularity, from Bristol Deft which was the epicenter of delft production. Delftware, also called limeware, Holland ware, and galley ware, is a type of earthenware that was coated in a lead glaze and tin ashes to make it clear so it could then be decorated with colored pigments of which blue was the most common. It originated in eastern Asia and spread to Western Europe in the 16th century. Due to its origins, delft design frequently imitated Chinese porcelains and reflected the growing popularity of Asian-inspired decoration. European colonization of that region meant a major influx of goods from the Orient which made an impression on the British culture. Delftware production in England began 1567, after which the center of production soon moved from Holland to England- particularly London and Bristol. The popularity of delftware grew by leaps and bounds in the American Colonies, becoming the most common type of ceramic export from the sixteenth to eighteenth centuries. Belden, Louise Conway. The Festive Tradition: Table Decoration and Desserts in America, 1650-1900. New York: W. W. Norton & Company, Inc., 1983. Day, Ivan. “Possets”. Historic Food. Ivan Day, 2003. http://www.historicfood.com/Posset%20Recipes.htm. Digby, Sir Kenelm. The Closet of the Eminently Learned Kenelm Digby Knight. London, 1670. Lange, Amanda E. “Delftware at Historic Deerfield, 1600-1800”. Antiques and the Arts Online. Bee Publishing Company, 2010. http://antiquesandthearts.com/Antiques/coverstory/2002-01-29_13-14-56.html. Wilson, C. Anne. Food & Drink in Britain. This entry was posted in Exploring the Artifacts.